Machine Stand: Stainless steel with casters, custom built for the Hollymatic Super Patty Machine. Conveyor: Optional 2_ neoprene or wire mesh conveyor with digital programmable counter/stacker. Net weight of Super Conveyor: 31 pounds. Supplies: To maintain your Hollymatic Super in top condition, contact your local Authorized Dealer for genuine Hollymatic parts, supplies and quality Hollymatic patty paper. Automatic paper interleaving system increases production capability and eliminates paper chips. 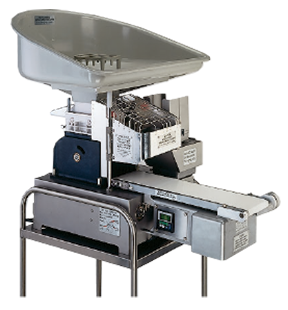 Paper can be added to the dispensing mechanism without the need to stop the machine. Feed Tray: Removable and safety interlocked w/guard. Paper Feed: 5-1/2_ (standard) automatic side notch system. Optional 4-1/2_, and 5_ available. Speed: 2,100 or 1,800 portions per hour. Portion Size: Standard up to 8 ounces per portion. 5-1/8_ Maximum diameter with paper. Compressors: 5 Oz. or 8 Oz., depending on portion size. 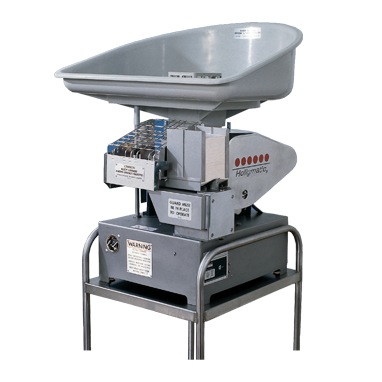 Net Weight: 285 pounds, including stand and mold plate.